An Emirati elder's meeting with royalty in Abu Dhabi is winning hearts online for his humility. 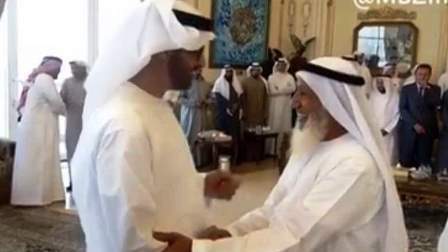 An elderly citizen's meeting with Sheikh Mohamed bin Zayed Al Nahyan, Crown Prince of Abu Dhabi and Deputy Supreme Commander of the UAE Armed Forces - at a palace - has gone viral on social media for the humility and respect Sheikh Mohamed showed for the man. In the brief video clip, the citizen is seen approaching Sheikh Mohamed to shake his hand and insists on kissing his forehead to express his love and admiration. "Every Emirati should kiss your head, so please allow me to," he said according to local reports. But instead, the gracious Sheikh Mohamed kisses the elder's forehead in respect - a gesture applauded by attendees and on social media. Netizens cheered Sheikh Mohamed for his gesture, here are some of the comments on the video: Qmsalameri said: "I cried over this moving scene, I'am proud of our leaders, may God protect them." Alfahad6242 said: "Our leaders teach us great morals and ethics every day, to them we are loyal until our last breath." husein_jundi said: "Every Arab should be proud for such great leader." qasab_suker said: "May God grant you long life." rhu0 said : "You are great with your ethics and your big heart and your mercy, you are the crown of our heads. Our leader and our pride. May god protect you."